> Healthcare > What Does Medical Grade Mean for a Computer Monitor? What Does Medical Grade Mean for a Computer Monitor? You may have noticed when purchasing monitors for use in a healthcare setting that the term “medical grade” or “hospital grade” carries a heftier price point. For example, Elo Touch 2401LM is a 24-inch LCD monitor with a medical designation and a list price of over $1,100; compare this to the ViewSonic TD2421 commercial grade 30-inch LCD with similar features and a price tag under $300. 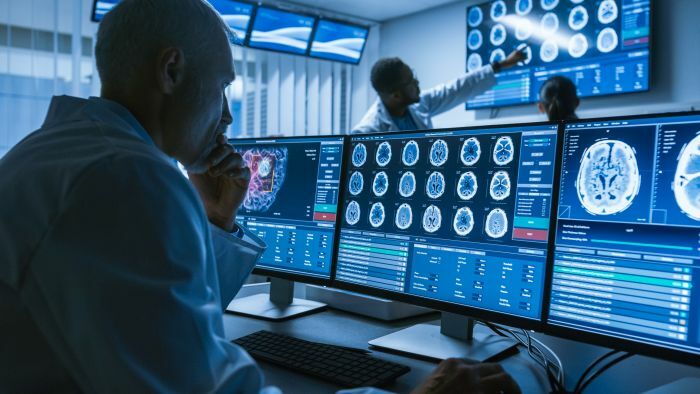 You will also find that newer models of commercial monitors are compatible with Digital Imaging and Communications in Medicine (DICOM) standards for handling, storing, and transmitting information in medical imaging—meaning they seem to be suited for medical use. So what gives? What makes a monitor medical grade, and why is medical grade so much more expensive? Medical grade monitors display more colors. Using the two aforementioned LCDs as an example, the medical grade monitor displays 1.074 billion colors, compared to the commercial version that displays 16.7 million. In case you were curious, the number of colors the human eye can detect is up for debate among researchers. Estimates range from 1 million to 10 million discernable hues. Why do we need ten times more colors than the eye can detect? Providing more colors allows for greater accuracy for matching an image with what the eye would actually detect. Doctors and surgeons use precise coloration judgments for guidance through a medical procedure or when making a diagnosis. Accuracy is critical in these situations, so the thinking is the more colors you have available, the better. It is important to note that monitors with high color displays rely on system-wide support of the 10-bit per color output they utilize. Bit output measures the number of RBG signals the system (a monitor and the computer it is connected to) can process. Without getting deep into the science of it, the more bits you have, the more precise color reads you get. Most commercial-level systems released after 2010 process 8-bit outputs. 10-bit capability generally is reserved for higher-end graphics processors and CPUs. The entire signal path must be taken into consideration—from the digital image file, to the operating system, to the software, to the video card, and finally the monitor. 10-bit output must be supported at each level otherwise it will not show up on the monitor. Another key difference between medical and commercial displays deals with automation of the backlighting system. Medical displays have a closed-loop control circuit to maintain stable peak luminance from a cold start to full warm-up. The medical display’s automated precision photometer continuously approximates desired peak luminance several times a second, providing a consistent level of luminance. The equivalent feature on a commercial display is the brightness control, which a user controls manually across a spectrum of light and dark without any reference to an absolute level of luminance. A commercial unit would require impossible levels manual calibration to provide the consistency a medical monitor delivers. There are other extra built-in features that medical grade monitors have as well. Most models have out-of-the-box calibration features for DICOM part 14 Grayscale Standard for viewing x-ray images. The chassis of a medical grade monitor often will be antimicrobial, meaning it is coated with a chemical agent that inhibits microorganisms growth, which has an obvious purpose in a healthcare setting. A medical grade monitor will comply with the EN/IEC 60601-1 standard of the National Fire Protection Association (NFPA) Health Care Facilities Code (NFPA 99), under which monitors used within a patient care vicinity cannot exceed leakage current levels of 100 microamps. If you’re using a commercial grade monitor in a healthcare setting and leakage current is a problem, an uninterruptible power supply (UPS) or surge suppressor can often provide a remedy. The Food & Drug Administration (FDA) 510(k) regulations govern whether a specific monitor can be marketed as medical device. Under 510(k), the manufacturer must demonstrate that a product is at least as safe and effective as a legally marketed device. This is something that is of more concern to manufacturers, although it does provide assurance to consumers that new medical devices are at least as competent as the ones currently on the market. A commercial grade monitor in a patient care setting is passable in some instances, so long as leakage current is within NFPA 99 rules. For viewing patient data and records at a nurse’s station, a commercial monitor works just fine. Using a commercial monitor in a diagnostic or surgical environment is generally not advisable. In these instances, purchasing a medical grade computer monitor is in the best interest of the healthcare practitioner and his or her patients. You may have noticed when purchasing monitors for use in a healthcare setting that the term “medical grade” or “hospital grade” carries a heftier price point. What makes a monitor medical grade, and why is medical grade so much more expensive?